Purina® Ultium® Gastric Care horse formula helps equine athletes during the stress of competition by providing optimal gastric and immune support. 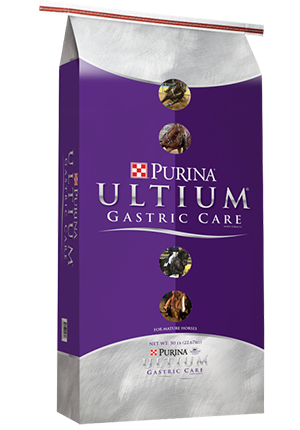 Purina® Ultium® Gastric Care horse formula was developed by Purina’s Ph.D. Equine Nutritionists and Veterinarians to provide consistent support during times of stress. This feed is the culmination of decades of Purina equine nutrition research, and contains specialized ingredients designed to support a healthy gastric environment and immune system. Horses thrive on consistency, but there’s nothing consistent about competition: performance schedules are anything but predictable, new neighbors arrive in adjoining stalls, and arenas and environments are constantly changing. This inconsistency can take a toll- affecting health, attitude, and performance. In fact, even common activities including stall confinement, exercise, and transportation are known to cause stress in horses, which may challenge their immune systems and can lead to gastric discomfort.